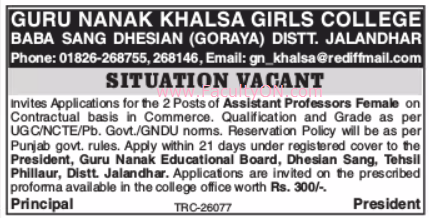 Guru Nanak Khalsa Girls College, Jalandhar has advertised in TRIBUNE newspaper for recruitment of Assistant Professor jobs vacancies. Interested and eligible job aspirants are requested to apply within 21 days from 14th November 2018. Check out further more details below. About College: The college was established in July 1970 to commemorate the 5th birth Centenary of Guru Nanak Dev ji. Efforts however were initiated in 1969 with a primary objective of opening the doors of higher Education to the girls living in this small town and the rural interior. The college is affiliated to GNDU, Amritsar. To begin with, it was purely an Arts Degree College, in response to the aspirations of the people of the area it broadly aimed at the economic, social and cultural growth of the Nation. But to cater the needs of the changing times, Commerce, Computer Science and Medical streams were added later on. With the deep-founded vision and missionary efforts of S. Mehar Singh Bassi the Institute started M.A.Pol.Sci. and M.A Punjabi in 1980. Application Fee: Rs.300/- (Can be had from college office). If you use downloaded form, make an DD for Rs.300/- and send it along with your application. How to Apply: Interested candidates are requested to send application in prescribed format along with copies of certificates and recent passport size photo to postal address provided below.